It’s the creature comforts of the Copacabana’s Palace spa, not Carnival, that will keep you coming back for more at this stellar South American respite. Inside the sand-dollar hued stone facade, all 145 neoclassical guest rooms in the main building received a sumptuous spiffing up, along with a stunning expansion of the lobby, including the widening of its breathtaking Carrera marble staircase and restoration of the longhidden original ceiling as part of $20 million renovation completed in January 2013. But it is the siren call of head-to-toe pampering alongside the hotel’s more illustrious guests that beckons to those seeking inner and outer beauty. After all, what is good for the Hollywood who’s who and heads of state is surely good for you. Amazon is applied. Then you’re treated to an aromatic tub soak and 90-minute massage, with special attention paid to the skin through gentle exfoliation. The final step: thorough body and facial moisturizing to bring back your epidermis’s inherent glow, as lovely as the moon over Rio. Some of the world’s most effective cures are derived from Brazilian plants, so it is no surprise that these ingredients feature in the spa’s exclusive AYASPA line of organic products. According to the hotel, they source oils from local fruits, as well as ingredients such as copal wood, sandalwood, lemongrass, and peppermint, for their extremely nourishing qualities to further enhance your sense of wellness and relaxation in the spa. And if you’re determined to slide into an eensie-weensie Brazilian bikini, the Palace Spa also offers a health boosting menu, customizable to a guest’s individual restrictions, needs, or healthy cravings. And fitness need not be foregone, either, via sessions at the hotel’s well appointed fitness center, rooftop tennis court, and swimming pool (the largest in all of Rio).And to think they nearly scrapped the storied hotel in 1985, more than 60 years after President Epitácio Pessoa had the foresight to ask Octávio Guinle, a well-known hotelier of the day, to construct what he hoped would be his continent’s—if not the world’s—most luxurious hotel. French architect Joseph Gire fashioned the design after the Mediterranean grand palaces of the Côte d’Azur in Nice and Cannes and it was not long before “the Copa,” as the cariocas of Rio dubbed it, became a magnet for every imaginable kind of celebrity and the symbol of Rio. In the thirties, Ella Fitzgerald and other legends performed there, making the Golden Room the number one show venue in Latin America. By the mid-1980s, the Copa began to look slightly worse for wear but was saved from the wrecking ball by Orient-Express Hotels, who acquired it in 1989 and spent over $50 million to refurbish the Copa back to its former glory. Today, the hand of French painter Dominique Jardy can be seen in the glorious trompe l’oeil over the elevators as you saunter off to your “apartment,” with its elegant, antique furnishings. The 600-strong hotel staff will cater to your every whim as you soak up the Brazilian sun. The beach staff will even look after your belongings if you decide to leave your sun lounger to take a swim in the sea. Want to visit the iconic 125-foot statue of Christ the Redeemer on Corcovado Hill in the majestic Sugarloaf Mountain? No problem. The hotel’s executive chef, Pierre-Olivier Petit, will prepare a picnic basket for a private visit before the crowds descend. Starved for a samba lesson at Rio’s oldest, historic samba center, Mangueira, or caipirinhas sipped to a bossa nova beat? The Copa will arrange every delicious step and swizzle stick swirl for the perfect Brazilian bit of hip swaying adventure. Curious about the world’s largest urban rain forest? The Copa is happy to arrange an open jeep trek to Barra da Tijuca, or a helicopter tour of all the area’s natural wonders for an exclusive bird’s eye view. The hotel’s restaurants offer a spectrum of sophisticated, global fare. First up, there are local Brazilian dishes like feijoada (fay-JWA-da)—a spicy, heady, meaty mélange of beans with tender cuts of smoked pork, spicy sausage, and braised beef served on Saturday afternoons —at Pérgula. Then there are well-melded, pan-Asian delicacies from chef Ken Hom at MEE, where a sake sommelier will school you on the finer points of all 25 selections of the rice-based beverage. There are chef Luca Orini’s Northern Italian classics, inspired by the day’s freshest ingredients at the Hotel Cipriani restaurant named for the Copa’s famed sister spot in Venice. 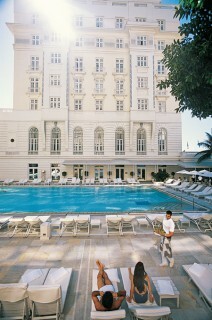 And be sure not to miss out on the city’s most exclusive social spot, the Piano Bar, where sparkling A-list guests come to mingle and whisper over aperitifs.The Belmond Copacabana Palace Hotel is the place to enjoy Rio de Janeiro in style, with enough privacy and panache to suit the world’s most luxury-minded visitors. And if you never want to leave? Well, blame it Rio. BELMOND COPACABANA PALACE is a 40-minute drive from Rio de Janeiro’s international airport and is ideally located next to Copacabana Beach. The hotel has 112 Rooms, 122 Suites, and 7 Penthouse Suites, all with spacious, recently renovated bathrooms with dual marble-top basins, porcelain enamel tubs, and separate showers, writing desk, iPod dock, widescreen TV, fully stocked mini-bar and Wi-Fi. Rooms are individually decorated with fine period furniture and original works of art. The Superior City View rooms face the city of Rio de Janeiro with those in the main building featuring the Copa’s grand, trademark high ceilings. Deluxe Beach View rooms overlook Copacabana Beach and some have a Juliet-style balcony. Penthouse Suites are decorated with exotic carpets and French fabrics and have a marble bathroom with separate bath and shower, butler service, and exclusive use of a private pool and terrace. Peak season is during the summer months, between December and March, where a stay at the hotel starts at $400 a night. During Carnival, the most memorable event to attend is the hotel’s black-tie Carnival Ball, where each year they choose a Brazilian celebrity as queen of the ball. The hotel will also be hosting the official opening dinner for Rio de Janeiro’s 450th anniversary celebration this year and it is the place to be when the Olympic Games come to town in 2016.